Welcome to the first week of the One Room Challenge and the first post on the Witch Hazel Studio blog! I’ve been following along with the One Room Challenge for a few years now and finally have a good excuse to join in the fun. The ORC runs from today to early May and I am expecting my first child at the end of May so I am taking the next 6 weeks to make our guest room a nursery! A little background on me before we get into the nitty gritty. I am currently pursuing a masters degree in interior architecture while working part time at a small residential design firm in Boston and managing a couple private clients at my own baby firm, Witch Hazel Studio. So while I’m spread a little thin these days, I’m loving every second of it and making sure I still have time for projects around our home. 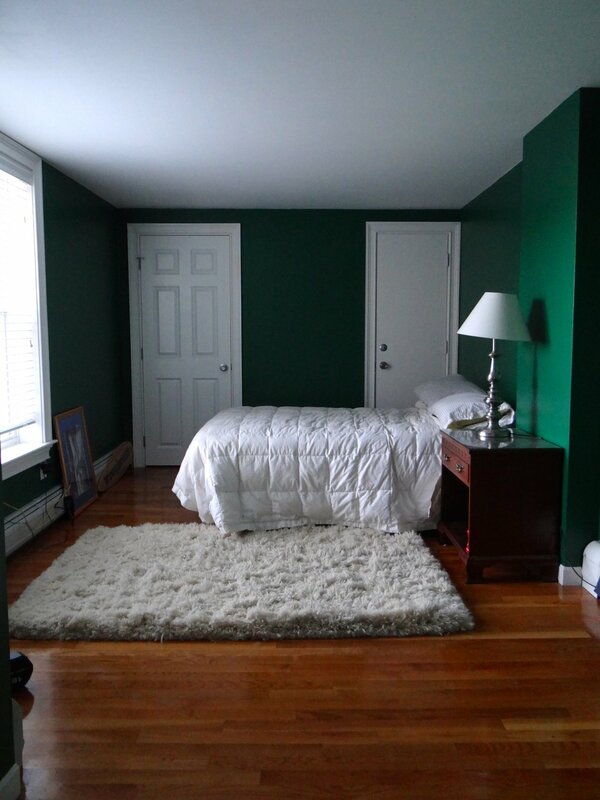 About that home, my husband and I have lived together in our condo on and off for the past five years and over that time our back bedroom has gone through several phases. Before my husband bought the condo, the previous owner did some misguided renovations, stripping all the character from the mid-19th century brownstone. We have been trying to slowly recover some architectural interest and remove the builder-grade finished since then. Bedroom V1 - yellow and hand-me-downs. This is how the back bedroom looked when I first moved in, well sort of, my husband had roommates at the time and the one who lived in this room was impressively messy. So imagine this but like a 25 year-old guy has lived in it for the past year and a half and has never done laundry. The room was bright and cheery but I’m not necessarily drawn to yellow walls and my college dorm room rug was not doing much to help improve the furniture left behind when the roommate moved out. When we moved back two years later, I was having a hard time deciding what I wanted to do with my career and decided the best way to deal with that was ignore it and take some of my stress out on the bumped out wall across from the windows. That was when the great hole of 2018 was discovered. In my haste to pull off the drywall and make the room slightly less narrow at this point, I only made one test hole. When I tore the drywall down I found not one, but two round holes in the chimney, one had been previously patched with some cement (never a good idea with old brick). At some point there was maybe a stove back here? Either way, I wasn’t about to re-drywall the thing so it stuck around with a plywood patch for over a year while I got up the courage to repoint the whole thing and patch in the missing bricks. While the plywood patch lived on the chimney, I repaired the drywall around the sides and top and painted the room a deep blue green up to an imaginary plate rail. This is how the bedroom looked until a couple weeks ago. The furniture all came from my husband’s childhood bedroom. 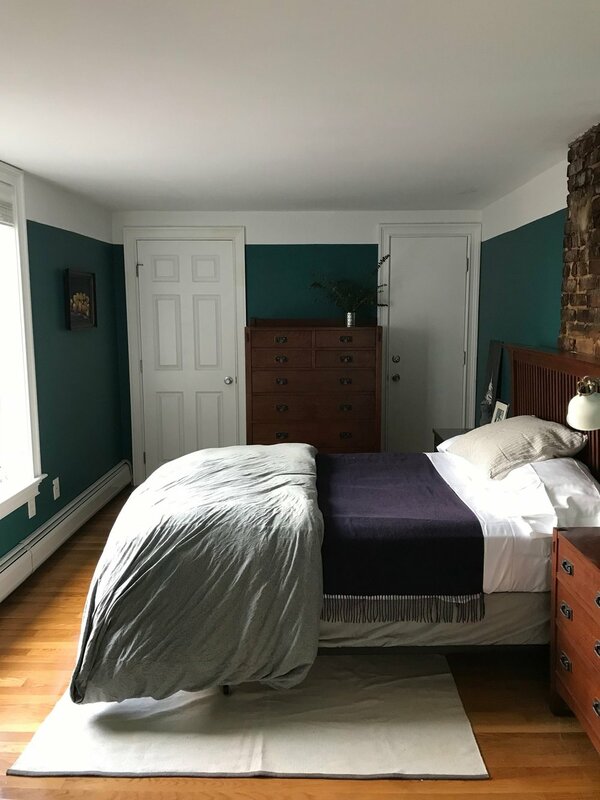 Though I’m not generally one for a matching bedroom set, especially a mission style, oak bedroom set that makes no sense in our greek revival brownstone, I liked this guest bedroom. But all good things must come to an end and this room will make way for a bright and cheery little nursery! Stay tuned next week when I share the inspiration for the new nursery and the new floor plans. Make sure to check out all the other ORC guest participants!